Yaya Toure's superb brace, plus goals from Wilfried Bony and James Milner ensured Manchester City tightened their grip on second place against the defiant Swansea. Shelvey broke from the half way line, stabbed a promising through ball to Gomis, who took it first time, zigzagged in and out past Demichelis onto his left foot before firing a low shot at goal. Joe Hart was equal to it; as the Englishman plunged down low to save. Swansea were pressuring the visitors early, and implemented a different style to the one against Arsenal when they sat back, absorbed attacks and counter attacked. City got pushed back, and were unable to do anything about it. Montero cut in from the left, fed the over-lapping Taylor who entered the area, knocked the ball back into middle but half-a-yard too far for Gomis and his left-footed effort blootered over the bar from close range. Terrific build up play, though. Moments later from a corner, Gomis sneaked past Demichelis, rose above him and planted a header just wide of the goal. It was the dream start from Garry Monk's side, who kept City silent in the opening 15 minutes. Pellegrini's men registered their first shot; coming from Kolarov's free-kick from outside the area which just curled around Fabianksi's post after a good attempt at getting the ball over the wall. The City left-back has fond memories of free-kicks from that range. Swansea almost broke the deadlock after slack play from City's defence. A high ball was whipped over Mangala let the ball bounce, but took a poor touch that enabled Dyer to race past him, cut back onto his left and curl a superb effort at goal. Joe Hart yet again saved; turning the effort around his back post. The away side became much more alive as the 15 minute-mark passed, with Swansea the side sitting back and absorbing pressure. Aguero latched onto a through ball down the ground, put himself through on goal where he chipped over Fabianksi only to find himself offside. 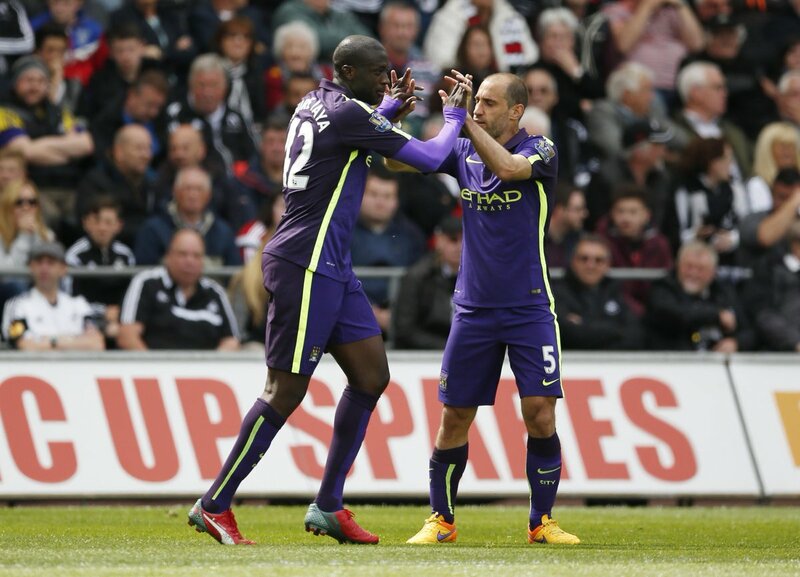 City's patches of success resulted in a goal from a man who has now scored in three consecutive games against Swansea, that being Yaya Toure. The Ivorian received possession on the edge of the area, fired a powerful shot away and the ball would clip Williams' leg, resulting in it bundling past Fabianski and into goal. Swansea had brief spells of possession, but their attacking play soon died down after City gained the early foothold. It was quite harsh on the Swans considering how well they started, but that is what has made Pellegrini's men so good. After difficult starts, they find ways through. Aguero latched onto Lampard's long ball, but with only himself up top he held up play and waited for assistance. Milner joined him, entered the left side of the box and received the ball where the Englishman cut back his marker and stunningly slot past Fabianski at his back post. That was surely the game already wrapped up for City. Swansea would fire themselves back into the game, right on the stroke of half time. The hosts controlled possession around the area, before Sigurdsson received the ball, took a touch and fired a spectacular pile-driver that dashed past Joe Hart into the right hand corner. After the break, Lampard and Aguero linked up well that resulted in the English legend firing a shot at goal, only to be denied superbly by the defiant Fabianksi. Swansea would then level things up on the 64th minute, with striker Gomis scoring his second goal in their second game. Both against elite operators, he got in between two City defenders, latched onto Richards' clever ball over and to fire a right-footed volley past Hart. However, the Swans' resistance was soon broken by none other than Yaya Toure, who racked up his second goal of the game. The Ivorian, from 30 yards out, held off pressure from Cork to rifle a destructive shot that pummelled off Fabianski's gloves and into the goal. The Swans almost levelled things up once more, as Fernandez met Sigurdsson's corner to plant a header that looked destined to land in the top left hand corner. However, an incredible acrobatic dive at full stretch from Hart would tip his effort over the bar. World class save. Pellegrini's men would wrap proceedings at the death, as former Swansea striker Wilfried Bony struck against his former side. He received the ball on the edge of the box, and unleashed an accurate grass-cutter that beat Fabianksi at his left post, sealing all three points for the visitors. Man City have all but secured second place now, with another solid win that puts Man Utd and Arsenal out of range to overtake them.